Our 2½ Acre Theme Park! 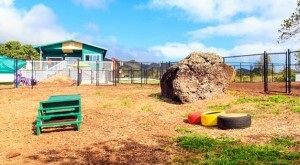 Kama‘aina K9 Adventures’ unique outdoor facility is based on 2.5 acres in the Kunia mountainside. Our facility features six individual adventure parks, including a jungle park with pools, miniature city, puppy surf and socialization park, tiny tot park, agility park, and miniature livestock park, all with a million dollar view. What was deemed an “unusable” piece of land, Jammin’ Jungle, our feature park, is nearly one acre and takes place in a gigantic, naturally made gully. For those that love to party, this is the place to be! This park features three oversized pools for those that love to cool off, massive boulders for those that love to climb, and exciting embankments for those that love to stretch their legs. Fruit trees, rasta-colored picnic tables, and shade structures also scatter the park. Town & Country is a miniature town that features homes, high rises, and lanais that make the perfect relaxation spots in the shade. Guests can mingle in our community clubhouse that includes a million dollar view of downtown or they chase a car should the urge strike. Our male guests can even fall in love with our authentic City and County of Honolulu fire hydrant! 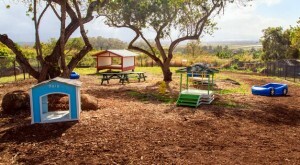 Menehune Meadows was built for our pint-sized pals and is decorated with plenty of features sure to entertain, including a colossal caterpillar tunnel, hide-n-seek play structure, giant boulder lookout, and cozy cottage! Guests can gather at our miniature picnic tables or cool off in our crab-shaped pool. 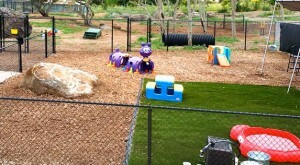 Agility Acres offers several agility obstacles that can be used as training and stimulation aids. 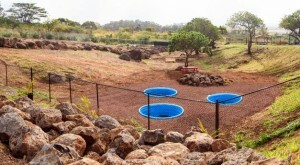 This park features a kukui nut tree grove, two giant tunnels, climbing platforms, weaving poles, and tire jumps! 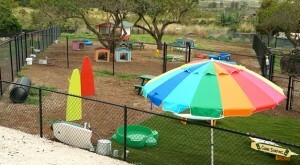 Kolohe Kids was designed for puppies who are ready for socialization but may not yet be ready to play with adults. This park features a fun, surf theme complete with surfboards, turtle pool, and surf tube! Pygmy Pastures is home to our miniature horses, pygmy goats, and chickens when they are not out grazing in our other adventure parks.